Control Devices CS25-100 Cold Start Valve 1/4"
When you have residential or commercial wastewater issues, you can count on Zoeller Pumps to deliver the very best solutions-our commitment to top quality offers you years of service and durability. Wayne pumps check valve, PVC body, 2-3/4 in overall length, 2-3/4 in overall width, 7 in overall height, black, includes: 1-1/2 in shoulder end Adapter, for use with all types of sump pumps. Wayne 66005-wyn1 1.5 in. Check valve kit. 1-1/2 inch pump thread with 1-1/4 inch or 1/12 inch pipe connection. For use with all types of sump pumps. Item has threaded male end 1 1/2 and outflow shoulder end 1 1/4, and includes 1 1/2 shoulder end adapter. The Control Devices ball-type check valve provides tight sealing, and can be used as a tank check valve for small compressors or as a component in pneumatic circuits. The valve body is made of brass for corrosion resistance, ductility at high temperatures, and low magnetic permeability. Brass can be connected to copper, brass, plastic, aluminum, and welded steel. Fluorocarbon O-rings provide higher temperature and chemical resistance. It has female National Pipe Taper (NPT) threads on one end and male NPT threads on the other for connecting a male and a female threaded pipe. The NPT threads create a tighter seal than straight threads. The maximum pressure rating is 250 pounds per square inch (psi), and the maximum temperature is 250 degrees Fahrenheit. Check valves have two ports and restrict the flow of fluids and other loose materials through a pipe or passageway to one direction. Flow enters through one port and exits through the other, closing when flow reverses or stops. Two common types of check valves are ball cone valves and swing check valves. A ball cone valve utilizes a spring-loaded ball seated against a cone-shaped interior surface to stop the flow of fluid in a forward direction, and a swing check valve has a movable disc on a hinge to block reverse flow. 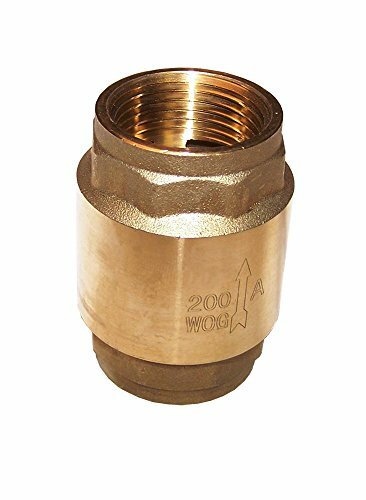 Check valves are rated by their cracking pressure (the minimum upstream pressure required for the valve to operate), and they are used in various water, gas, air, and steam lines. 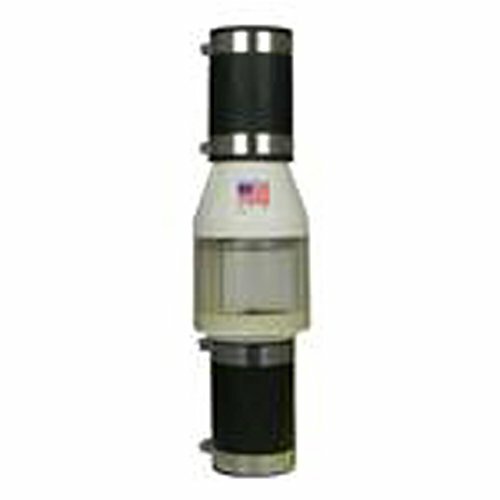 Control Devices manufactures specialty valves, nozzles, and condensate traps. The company, founded in 1963 and headquartered in Fenton, MI, meets ASME standards. 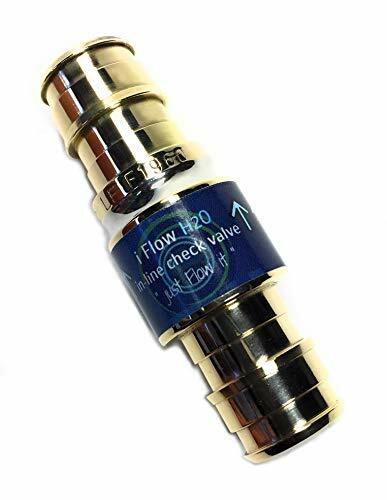 2', Quiet Sewage Check Valve, No Slamming When Flapper Closes, Clear Heavy Duty PVC For Monitoring Check Valve Operation, True Union Design Allows For Easy Repair Or Pump Replacement, 1/2 LB Stainless Steel Spring, Solvent Weld Connection To Piping. 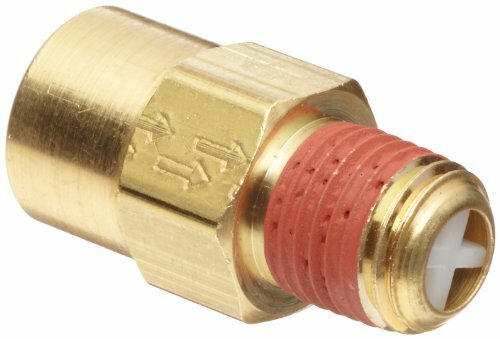 Model TV12 tank valves include a brass body, nylon cap, and standard tire core valve. They are used wherever a method of inflating a tank with a standard air chuck is required. 1/8" NPT inlet. 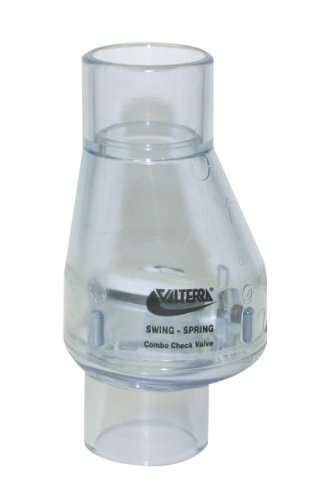 This Valterra 200-20W check valve is made of white schedule 40 PVC (polyvinyl chloride) for strength and resistance to corrosion and mild chemicals. Its EPDM (ethylene propylene diene monomer) seal resists degradation caused by water and oils, and its full flow construction allows for insignificant flow loss at the swing check, so no spring is needed. It has 2" slip connections at both ends, which must be fastened with glue, and a maximum pressure rating of 150 pounds per square inch (psi). 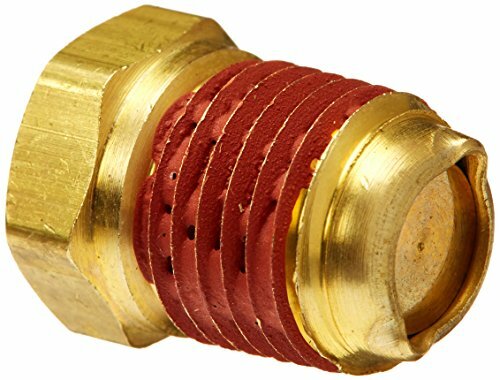 This check valve is suitable for use with landscape and irrigation, pool and spa, aquaculture, and general purpose applications. 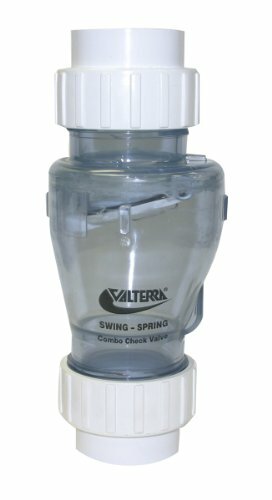 Valterra Products manufactures and distributes valves, hoses, sewer systems, and pool and spa products. The company, founded in 1981, is headquartered in Mission Hills, CA. When installed with the Single Function Pressure Balance Valve Cartridge RP70538, this check valve helps to protect you and your family from sudden temperature changes. Single-function valves conveniently control water temperature and volume with one handle. You can install with confidence, knowing that Peerless faucets and parts are backed by our Lifetime Limited Warranty. 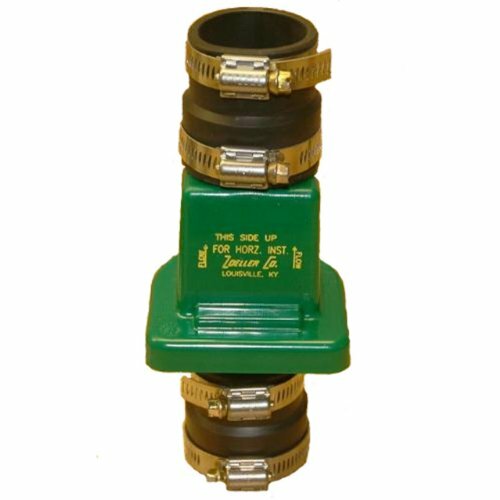 Rubber Hose Coupling: Valves are designed to fit on standard sump pump line connections. Easy to install over 1 1/2" PVC pipe (schedule 40 or 80), steel pipe, or copper tubing. One piece housing construction, no gasket to fail or leak. Housing is. The American Valve G31SL is a lead-free spring check valve with female threaded ended. 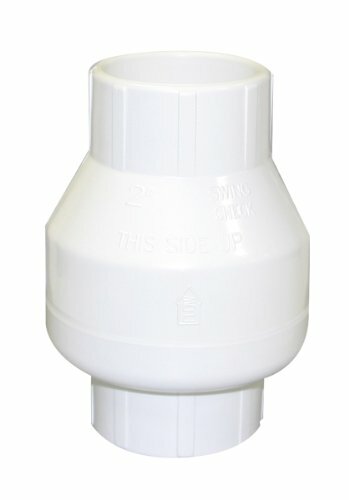 This in line check valve is designed to prevent backflow. It may be used vertically or horizontally. Ideal for use where Lead-Free valves are required. Designed for installation on potable water lines to protect against both back-siphon age and backpressure of polluted water into the water supply. Assembly shall provide protection where a potential health hazard does not exist. This high Performance anti-leak check valve will solve your back-flow problems, install it and forget it! Its high strength super advanced "PTFE" solid ball and a"Viton/FKM"-"O-Ring" encased by a Brass durable body that can withstand operating pressures of up to 280 psi and high temperatures of up to 380 Degree-F. "All time highest ratings in its Class". Perfect solution for conditions in-line where Plastic, Aluminum or copper that affects or compromises the quality/condition of fluid flowing. This design allows for maximum flow in-line, when positive moving fluid flow occurs, the ball moves freely to a center cavity away from sealing "O" ring allowing for maximum flow all around the ball with zero fluid resistance. On an instant, negative movement or reverse fluid flow occurs, fluid pushes ball back into its posi-seal "O" ring for a solid stop! In this innovative dynamic design there are no, hinged parts, flaps, screws, springs, diaphragms to restrict flow, or malfunction. It may be used in vertical or horizontal configuration. With your "I flow check valve" in-line, you can feel confident your fluid will remain in a "one-way" flow, or boats will stay primed to start in the middle of a lake, keep out unwanted water from your hull thru your bilge pump. Emergency Generators will keep fuel primed ready in a moments notice to start. Motorcycles, ATVs will stay primed ready to start. Fish Aquariums won't drain in an Elec power loss. Can be safely used in potable h2o syst, fish aquarium filter pumps, hydronic floor heating sys, microbrew, recirculating pumps, hydroponics grow pumps, heating fluids, antifreeze fluids, reclaimed H2O and many mild oils/chemicals. Versatile check valve. PROBLEM IT SOLVES; Its an in-line, one-way automatic ball valve stop, which prevents liquid-fluid from back-flowing, returning or loss of prime in potable water, mild Chemical or fuel line. Valvula de retencion de agua . IN-LINE USES; Micro Brewing, Potable water, Fish aquarium water filter pumps, Beverage, Pex tubing, Boat marine, RV, Hydroponics grow, Hydronic heating, harsh fluids like fuel, diesel, oils and mild chemicals. NOT 4 DIRTY POND WATER USE. COMPLIANT; NSF listed, meets UPC, IPC and cUPC standards, ASTMF-1960, PPSU, Lead free, non-corrosive, with a Dynamic PTFE solid ball stop and a Viton/FKM-O-Ring inside for a posi-seal-stop. Can withstand a high operating range of 380F and 280PSI, the HIGHEST RATING IN IT'S CLASS. EASY INSTALLATION; Arrows point liquid flow direction, ACTUAL SIZE 1/2x 1/2 OD, Barb x Barb push-in quick connection for Vinyl braided Hose, Pex tubing, cpvc, Heater Hose. Its durable Premium Brass body allows for mechanical stainless steel clamps or compression crimping-rings brass/copper to secure a tight connection. SIZE- Barb x Barb (Outside Diameter)(OD) is 1/2x 1/2 inch or 0.522 x 0.522inch , WARRANTY; If it fails! Within 3yrs of purchase, WE WILL BUY IT BACK! See wrnty. Zurn Engineered Water Solutions is a recognized leader in commercial, municipal, and industrial markets, delivering sustainable building solutions for new construction and retrofit applications. At Zurn we are committed to providing smart solutions that save both time and money. 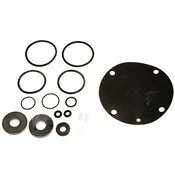 This repair kit includes 2 cover O-rings, 2 poppet assemblies, 1 no. 1 check spring, 1 no. 2 check spring, 1 relief valve stem assembly, 1 relief valve spring, and 1 seat repair kit (RK34-975XLSK). This complete poppets, springs, and seats repair kit is intended for use with 0.75" and 1" Zurn models 975XL and 975XL2. This is a complete rubber repair kit for the Febco 825Y series reduced pressure zone backflow preventers. This kit includes rubber parts for both check assemblies and relief valve. Genuine Febco repair parts. Price For: Each Material of Construction: PVC Max. Temp. 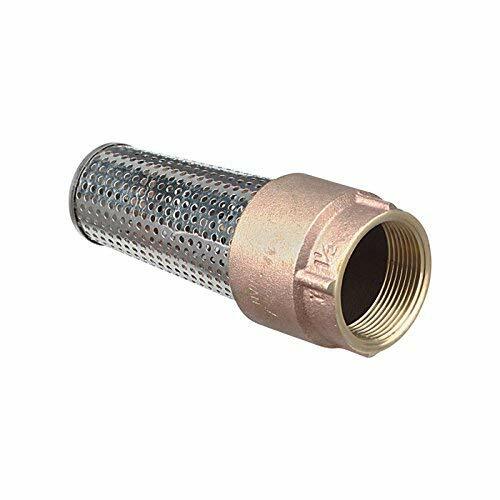 : 73 Degrees F Seat Material: PVC Sub-Category: PVC Item: Check Valve Seal Material: 40 ShoreNBR Spring Material: Stainless Steel Length: 2-5/16" Cracking Pressure: 0.5 psi Connection Type: Slip x Slip Overall Height: 4" Mounting Position: Any Width: 2-5/16" Max. 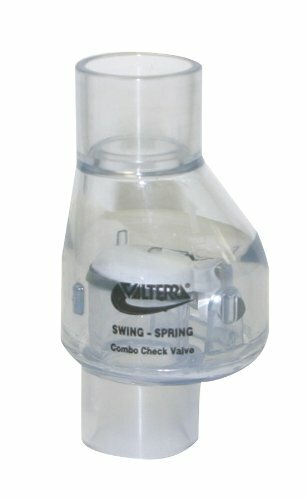 Water Pressure: 150 psi Size: 3/4"
This Valterra 200-C10 check valve is made of clear schedule 40 PVC (polyvinyl chloride) for strength and resistance to corrosion and mild chemicals. Its EPDM (ethylene propylene diene monomer) seal resists degradation caused by water and oils, and the swing/spring construction of this valve makes it possible to install it in any position. It has a 1" slip connection at each end, which must be fastened with glue, a maximum pressure rating of 150 pounds per square inch (psi), and a spring tension of 1/2 lb. This check valve is suitable for use with landscape and irrigation, pool and spa, aquaculture, and general purpose applications. This item is made to fit over a 1 PVC pipe. It is a slip fitting. This Valterra 200-CU20 union check valve is made of clear schedule 40 PVC (polyvinyl chloride) for strength and resistance to corrosion and mild chemicals. Its EPDM (ethylene propylene diene monomer) seal resists degradation caused by water and oils, and the swing/spring construction of this valve makes it possible to install it in any position. It has a 2" slip connection at each end, which must be fastened with glue, a maximum pressure rating of 150 pounds per square inch (psi), and a spring tension of 1/2 lb. 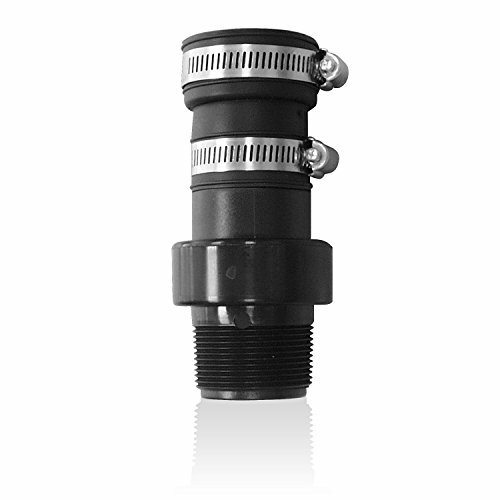 This check valve is suitable for use with landscape and irrigation, pool and spa, aquaculture, and general purpose applications.